Powers/Abilities: The Haab are a water-breathing race created by the Banari to serve them. The Haab can breathe underwater, possess superhuman strength (class 50), and have sharp teeth. The Haab have simple minds, and without the guidance of the Banari, will only seek out food. History: (Sub-Mariner I#56) - In attempt to save the Banari race from a virus which had slain most of the male population, Fraternus Prime led the Banari Brotherhood to earth in the hopes of making it their new home. Crashing in the ocean, the Haab they had on board roamed free, and attacked nearby Atlanteans. The Sub-Mariner caught up to the Haab, and slew them, ending the threat. However, the Atlanteans subsequently slew the Brotherhood, having mistaken them for enemies following the Haab attack. (Sub-Mariner I#58) - However, one Haab survived. It was later presented to the sole surviving Banari, Tamara Rahn by the Atlanteans. She used the Haab to assist her in her attempt to attack Atlantis for slaying the Brotherhood. Her plot was foiled by the Sub-Mariner, who wrecked her vessel and defeated the Haab in combat. The Haab was still on board the vessel when it was destroyed. BTS- When the remaining Banari were conquered by the Fomalhauti, the Haab continued to serve the Banari under their new masters. Many Haab joined the Fomalhauti Xlyym, a member of the Starblasters. (Captain Marvel I#27) - One Haab joined Thanos' crew. He was among the aliens that fought Starfox and Mentor. (Namor I#46) - As part of the Starblasters ploy to distract earth's heroes while they captured Kayla Ballantine, Xlyym was directed to set up two Planetary Thrusters to tear the earth apart. He dispatched the Haab to set up the devices. Discovering the Inhuman Triton nearby, Xlyym sent the Banari and Haab to battle him, and he was defeated with the arrival of Tiger Shark and Tamara, finally struck down by Trieste's most loyal Haab, Zun. They brought Triton back to Xlyym, and placed a Skullhugger on him, making him their ally. 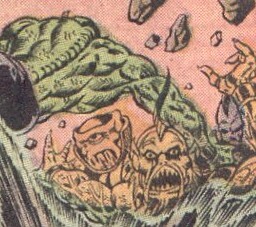 The Haab and Banari then accompanied Triton in battling the Sub-Mariner and Stingray. (Namor I#47) - During the battle, Tiger Shark and Tamara turned against Xlyym, and Tamara struck down Trieste from behind, destroying her Skullhugger. Unfortunately, Trieste died of the injury. Zun then transferred his loyalties to Tamara, and followed her back to Hydropolis, an underwater city being built by human and Atlantean work crews. (Namor I#48) - The Sub-Mariner and his allies set after the Planetary Thrusters, and encountered more Haab at the site of one Thruster. The Haab attacked the Invisible Woman, forcing her to abandon her attempt to lay explosives on the Thruster. However, Zun had followed the heroes to the site, and he carried the explosive into position, destroying himself, his fellow Haab, the Banari Sisterhood, and the Planetary Thruster all at once.